You don’t win two Norris Trophies as the NHL’s best defenseman if you’re an average player. That’s what had San Jose Sharks‘ brass and fans puzzled early in the 2018/19 season as newly-acquired Erik Karlsson was playing just average hockey. The 28-year-old native of Landsbro, Sweden had arrived via a blockbuster trade with the Ottawa Senators just a month earlier amid a great deal of hype and fanfare. However, the 15th overall draft pick in 2008 certainly didn’t live up to the lofty expectations once the season faced off. Most fans figured it would be just a matter of time before he got his mojo back though since he’s simply too good of a player to struggle for an entire season. Karlsson’s been on fire for the past few weeks as his offense has suddenly exploded with a goal and 25 points in his 14 last games. This is the type of production the Sharks expected from him since setting the bar so high after breaking into the league in 2009/10. The talented blue liner has scored at an impressive pace of .95 points-per-game throughout his NHL career and some fans started to panic when he notched just 10 points in his first 20 outings with the Sharks. It did take Karlsson a little time to get used to his new surroundings and teammates, but he’s now fitting in like a glove on the west coast. When he recorded three assists in a 7-2 home rout over the Edmonton Oilers on Jan. 8Th, Karlsson extended the franchise record to 14 consecutive games with at least a point. He also became the 13th rearguard in league history to achieve the feat and the fifth to go at least 14 consecutive outings with an assist. The current hot streak saw Karlsson rapidly climb the scoring list for defensemen this season with three goals and 41 points in 43 contests. But even though Karlsson wasn’t producing points at his usual rate earlier in the year he was still playing effective hockey. He was doing just fine when it came to Corsi percentage and scoring chance percentage over the first quarter of the season, but simply wasn’t having any luck putting the puck in the net and neither were his teammates after being set up by him. Karlsson and the rest of the Sharks have been much better offensively since then and he’s now being mentioned in conversations as a potential Norris Trophy winner once again. He’s playing an average of 24:52 minutes per game while his teammate and fellow Norris candidate Brent Burns is logging 24:17 minutes a night. This gives San Jose two of the top offensively-gifted defenders in the NHL with Burns on pace for a 90-point season and Karlsson projected to reach 77 points. Burns is also on a roll at the moment with 14 points in his past seven contests. Most Sharks’ fans aren’t really worried about who takes home the Norris Trophy for this season though as their sights are set on claiming the Stanley Cup in the spring. In the meantime, Karlsson will be trying to extend his points and assists streak while hoping he can tie or break Paul Coffey’s record of 17 consecutive games with at least one assist for a blue liner which he set in 1985/86. Coffey also holds the record for games with at least a point at 28 which was also set in 1985/86 when he netted 16 goals and 55 points during that span. The Sharks are currently in a dogfight for first place in Pacific Division and Western Conference with the Calgary Flames and Vegas Golden Knights. 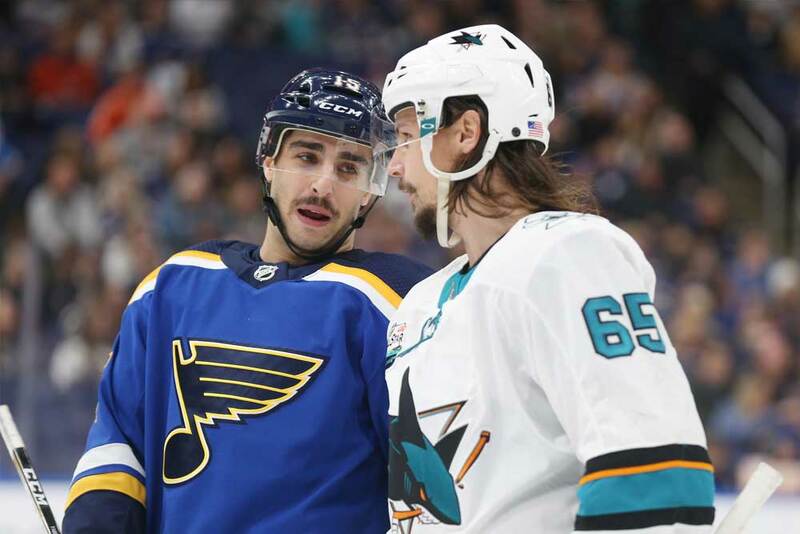 The team would need to collapse over the second half of the season to miss the playoffs, but this doesn’t mean they have the room for complacency especially with rearguards Justin Braun and Marc-Edouard Vlasic currently sidelined with injuries. They’ve gone 13-3-2 on the ice since December 2nd though and haven’t shown any signs of slowing down. Oddly enough, some Sharks’ fans are now worried about Karlsson because of his fine play of late. They’re actually sweating at the possibility he won’t be around after this season since he’s scheduled to become an unrestricted free agent in July. San Jose acquired the former Senators’ captain as well as forward Francis Perron by sending them a package of young prospects and draft picks last September. They gave up blue liner Dylan DeMelo and forward Chris Tierney along with a couple of prospects up front in Rudolfs Balcers and Josh Norris. In addition, they sent along their first-round draft pick in either 2019 or 2020 as well as their second-rounder in 2019. The Senators will get the first-rounder in 2019 if San Jose misses the postseason this year and if they make the playoffs they’ll get it in 2020. When Karlsson was struggling earlier in the season rumors started flying that he wasn’t really that receptive about re-signing with the Sharks. Of course, if anything could change his mind it would likely be his improved play, the setting of a franchise record and a long run in the playoffs. On the other hand, San Jose would have given up a great deal of their future to land Karlsson if he should decide to walk away at the end of 2018/19. With the way Karlsson and the rest of the team is playing though it looks like the Sharks will probably take that risk when the trade deadline rolls around on February 25th. Still, they should expect some playoff-bound clubs to come knocking to see if they’d be willing to trade him as a rental player for the postseason.